← How to Greet Yoruba parents and elders. This must be one of the most common street foods around Ghana and i am sure everyone has had some. Even the thought of it makes me hungry. Kyinkyinga is sometimes made in different ways, but i’ve discovered that this is the most easiest way and adding your home made suya spice makes it even better! 1. First of all you will need to Blend your ginger, garlic, onion, stock cube seasoning with the oil to form a smooth paste. Now set this aside. 2. Now cut your chicken or meat into chunks and Add the paste all over the meat or chicken and marinate for about an hour. 4. Mix all the ingredients for the suya seasoning into a large bowl. 5. 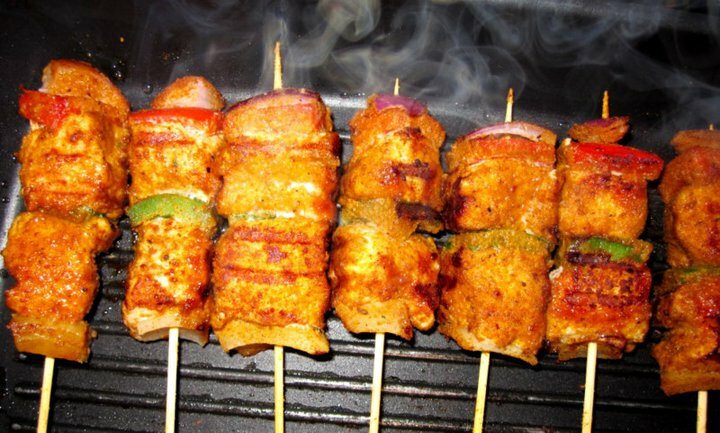 Once the suya seasoning is ready, sprinkle some of it on the skewered chicken/meat and grill till it is cooked and browned both sides. This entry was posted in Ghana, Ghanaian Food, Recipes and tagged Africa, Ghana, Ghanaian food, Kyinkyinga. Bookmark the permalink. I love this blog! So glad I found you via Google. I’d love to feature you on my blog. Please let me know if you’d be interested!